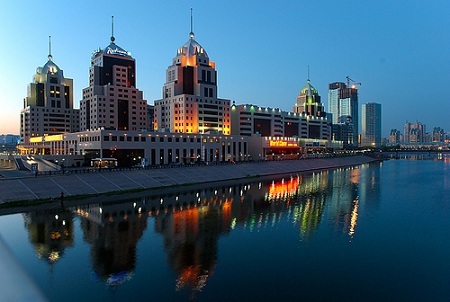 Kazakhstan luxury hotels are located in major cities like Almaty, Astana, Atyrau and Aktau. You find the largest number of 5 Star hotels in Almaty, as the majority of various Kazakhstan events take place in Almaty. All 5-star hotels have been built not that long ago, apart from one, which is the Hotel Dostyk in Almaty. Up to 1991, it was used by the communist party elite. Dostyk Hotel managed to smoothly transfer from the old centralised economy to the to days market without damaging its reputation of the best hotel in Kazakhstan. So if you want to have a taste of old traditional look mixed with the modern style and highest standard of service, then the Hotel Dostyk can offer you exactly this. 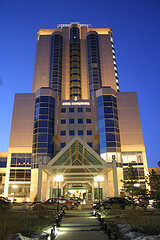 Almaty Hyatt Regency is the first western style 5 star luxury hotel built in Kazakhstan, even in Central Asia. You could hear local people talking of this beautiful marine coloured building getting built just behind the Almaty Circus. To see a building that looked absolutely different from the traditional shapes and especially colours, was very exciting. And now it is there looking as part of the city that has been there for ages. Although it is merely 15 years old. Formerly known as the Regent Almaty, the Intercontinental Hotel sits on the very top of Zheltoksan street facing the Presidential Palace. One of its many best features is the magnificent views to the Tian Shan mountains. 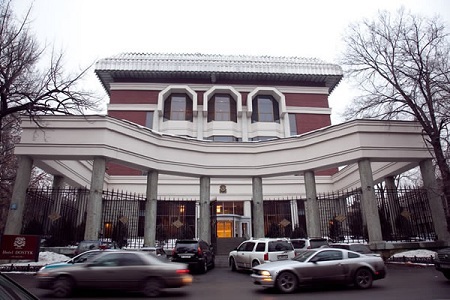 Many international events, like the Annual Eurasian Media Forum take place in this hotel. 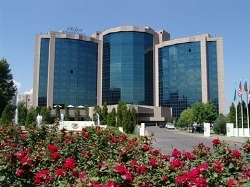 Rixos Almaty Hotel, the latest premium five-star 12 storey hotel, has been opened October 2009. This is THE hotel if you are to host an elite event, as it has extensive meeting facilities that can accommodate over 1000 people. And I don't have to mention all the latest necessary comforts for a business traveller. There is a shopping mall as well as restaurants, disco bar, swimming pool, SPA center and fitness centers. 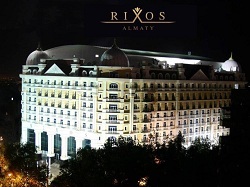 Read more about places to see when you stay at Rixos Almaty Hotel. 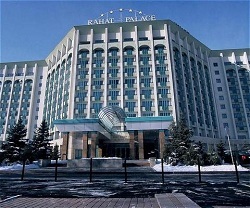 Royal Tulip Almaty is the newest of all Kazakhstan luxury hotels. It sits on one of the main avenues of Almaty - Dostyk Avenue with the beautiful mountains in the background. It means that you don't have to go through the busy city traffic to get to Medeo or Chimbulak. If you like to be independent from taxis or personal drivers you have a bus stop just in front of the hotel to take you up to the mountains or down to the city center. There are two more chic hotels on their way to be opened in coming years. The Radisson SAS on the way to the highest skating rink in the world Medeu and ski resort Chimbulak, within a national park. Marriott Almaty 2013. Right in the center of the new Esentai Park Project you can see the 40-storey mixed use glass tower of the JW Marriott Hotel.